Duke Ellington is one of the premier musicians of the 20th century. Books have been written about him, his image is on a U.S. postal stamp, he has been honored with doctorates and the Presidential Medal of Honor, and the anniversary of his 100th birthday occasioned a nationwide Centennial. His contributions to the jazz genre are many. His bands in the ’20s and ‘30s introduced “jungle music” which incorporated African influences. Ellington was more conscious of musical form than his predecessors. He thought in orchestral terms, using the band as his instrument. 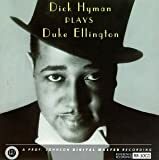 He wrote specifically for his musicians, drawing on their talents as soloists and ensemble players to create the “Ellington effect,” so-called by Billy Strayhorn. He used instruments in unusual roles within the band and rarely soloed on piano, preferring the role of arranger. Because Ellington was forward looking musically he was able to keep his band together until his death when his son Mercer took over. Many of its members were with him for three decades. In 1959 Ellington scored the film Anatomy of a Murder in which he also played the role of a pianist named Pie Eye. In his later years he devoted himself to composing “sacred concerts” which were complex pieces to perform because of the personnel required: orchestra, choirs, soloists and dancers. A partial list of his memorable compositions must include: “It Don’t Mean A Thing (If It Ain’t Got That Swing)” (1932), “Sophisticated Lady” (1933), “In A Sentimental Mood” (1935), “Prelude To A Kiss” (1938), “I Got It Bad (And That Ain’t Good)” (1941), “Don’t Get Around Much Anymore” (1942), “I’m Beginning To See The Light” (1944), and “Satin Doll” (1953).